(Image at left - click to enlarge) Catabolic processes provide intermediates for synthetic or further catabolic pathways and release energy, usually as the energy carrier molecules ATP and NADPH. In the first stage of catabolism, the storage forms of proteins, triacylglycerols, and polysaccharides are broken down in the cell's cytoplasm into amino acids, fatty acids, and glucose, respectively (1). 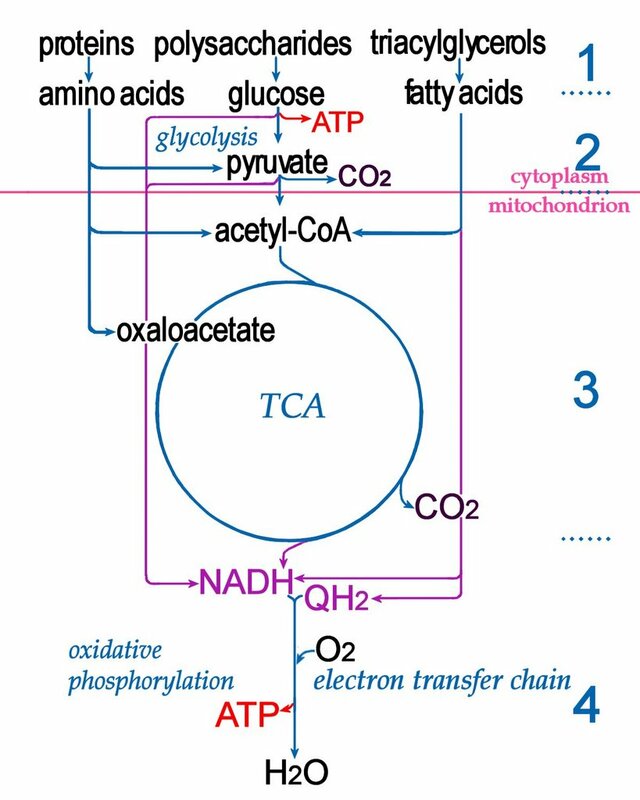 Within the mitochondrion, the intermediates generated by catabolism of proteins, fats, and sugars (2) are delivered to the Krebs tricarboxylic (citric) acid cycle (3). 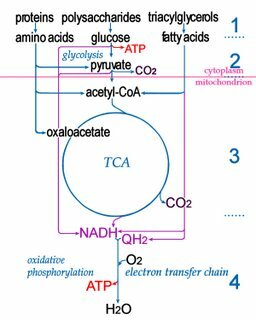 The catabolism of proteins delivers pyruvate, acetyl-CoA, and oxaloacetate to the Krebs TCA cycle. Beta-oxidation of fatty acids ultimately delivers acetyl-CoA. Glycolysis generates acetyl-CoA via pyruvate. Products of the Krebs cycle are then processed by oxidative phosporylation (4).